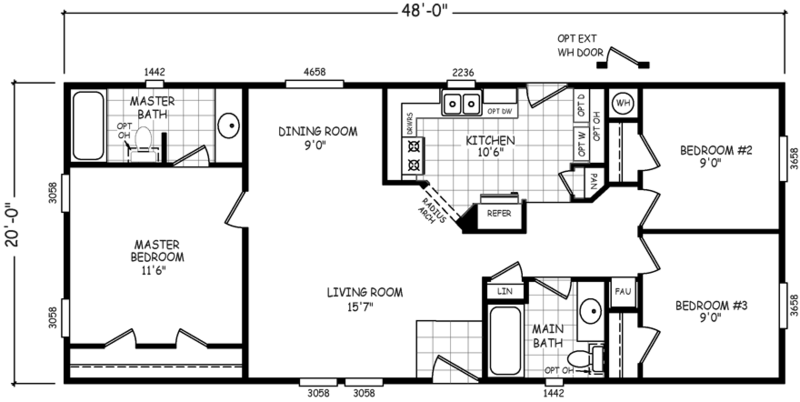 The Ouray model has 3 Beds and 2 Baths. This 960 square foot Double Wide home is available for delivery in Arizona, California, Nevada, New Mexico, Colorado, Utah. The first thing most homebuyers notice about the Ouray mobile home is the elegant archway that divides the large living/dining room from the kitchen. Dig in a little deeper and you’ll notice the pantry and linen closet that have been included for your storage needs. Think about adding the optional dishwasher and washer/dryer to your kitchen. If pictures are shown, they may depict upgrades and options that are not included within the base price of the home. Ask your housing consultant for details about the other great features that come standard on the Ouray manufactured home.